Description: Now preserved Canadian Pacific H1b 4-6-4 2816 built in 1930 was the oldest of eight steam engines that arrived at Windsor Station in Montreal this morning. 2816 was a revelation - I thought all CP Hudsons were streamlined - there were not many sources of information in those days. Description: Canadian Pacific H1b Hudson 2816 is ready for a late afternoon train out of Windsor Station. Description: Canadian Pacific H1c Hudson 2816 (preserved by CP) leaving Montreal with an afternoon commuter train. The other engines are G3 Pacifics. 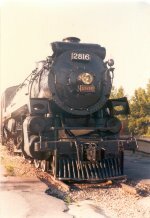 Description: Thats a younger me hanging off the side of CP 2816 at the old Steamtown site in Bellows Falls, VT. Three decades after this picture was taken, CP 2816 was restored by Canadian Pacific, and currently runs excursions. Description: One of CP's hudson types. Description: Year, date, location & photographer are unknown. Description: look what I found!! Description: nice engine - heh? Description: The 2816 heads toward home on the Breakfast for Learning tour. Description: CP 2816 arrived in Montreal from the west, seen here near Dorval train station. Very impressive... being just 10 feet away.